Monrovia – A British humanitarian, who is on a mission to help impoverished Liberian communities and orphans, says “giving resources” to people in need makes them self sustainable in the future. Aihtsham Rashid arrived in Monrovia at the weekend and will conduct an assessment of over 20 orphanage homes in six counties in order to provide support for them. He will also provide feeding for thousands of orphans as conduct the research. Mr. Rashid is the CEO of The AKHIRAH TEAM, a UK based charity organization working in many countries across the world. In Africa, the charity has provided safe drinking water for poor communities, solar panel to rural communities, as well as medical supplies and drugs. The group also provides free eye test and treatment for thousands of patients across the continent. Mr. Rashid told journalists in Monrovia that his visit to Liberia is based on the invitation from a Liberia-based charity organization, Vision for Liberia Inc. after he met the group’s Executive Director James Lackay in Banjul, The Gambia. He said they held discussions and agreed to collaborate to impact thousands of orphans in Liberia. In The Gambia, the British Charity is already feeding over 5,000 children daily; it underwrites the cost of students fees and has built water borehole wells for several communities. “We do not give money to people, we give them resources so they can generate money – people in the provinces or counties, money is not going to help them,” Mr. Rashid said of his charity’s module of impacting communities across the world. In Liberia, the two charity will collaborate to provide food and health care support to orphanages in six counties. While in Liberia, the AKHIRAH TEAM will also assess the needs of orphanages, which will include food, clothing, and education needs. They will then collaborate with the Liberian charity to continue supporting these orphanages. 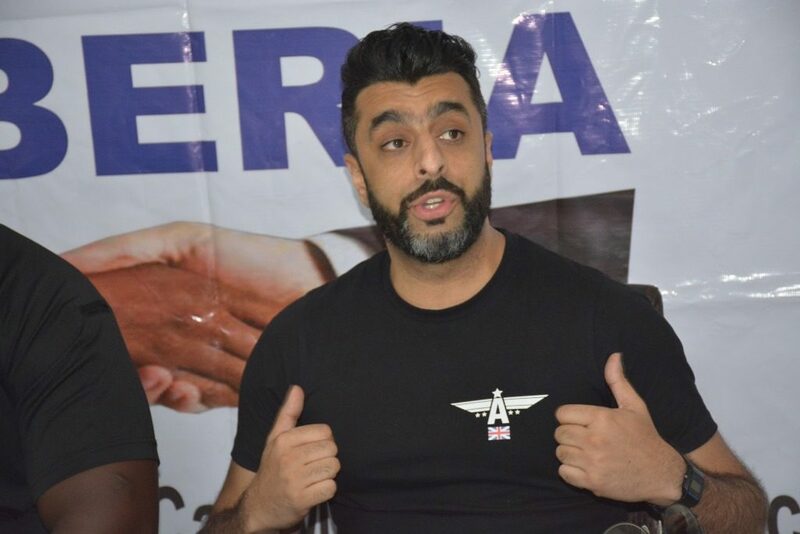 Although Mr. Rashid didn’t disclose how much money the charity has planned to spend in Liberia, he stressed that the determination would be made following an assessment in the next couple of days. “I know, in the Gambia, how much you need to feed one child; I know how much to build an orphanage to house a hundred children and I know how much to pay for a child’s education – because we’ve done that. So, until we conduct research in Liberia we cannot put a figure there,” he said. “But it won’t be that much different to The Gambia, so it is best we are accurate then we can raise the fund… but whatever the figure it will be helping some people. Mr. Rashid, who is a property developer from Leeds, West Yorkshire, says his work as a humanitarian has dignified him more than his business ventures and successes, and that he’s committed to helping the needy. “We do not care about the religion. Yes! We are a British Muslim charity who do not discriminate – we also help people in the churches, we also help people in the mosques. So, we look at the broader picture,” he says. Meanwhile, the Executive Director of Vision For Liberia said his organization specifically engaged its British counterpart to help buttress their charity work in Liberia because “we are aware the government can not do all”. Mr. Lackay says his organization sees the presence of the British charity CEO in Liberia as a “dream come true” while expressing excitement that they were lucky to convince him that his intervention was also needed in Liberia. He said Grand Bassa, Bomi, Grand Cape Mount, Margibi and Bong County are the first five counties that will benefit from the collaborating charity work that will be targeting at least 4,000 orphans. Lackey then disclosed that his organization is collaborating with the relevant Liberian government agencies to ensure that their activities fall in line with the government’s policies. He added that his team has been conducting an assessment of orphanages in the country and have gathered that many of these facilities risk being shut down by the government because they don’t meet the minimum standard to operate. “The safety of the kids – these places are not fenced; some don’t have safe drinking water. These are the challenges that they have and we believe that working with the Akhirah Team will help alleviate some of these challenges,” Lackay said. “We believe that with our success in The Gambia that if use the money correctly, you can help the people anywhere,” he said. Rashid, who says he followed Liberia’s President George Weah during his days as a soccer star, is fascinated about coming to Liberia and supporting the government through his charity work. “If we can somehow meet him it will give the charity and also our followers a lot of joy and motivation that the President is supportive of our work,” he said.